Holmium is a chemical element wi the seembol Ho an atomic nummer 67. Pairt o the lanthanide series, holmium is a rare yird element. Holmium wis discovered bi Swadish chemist Per Theodor Cleve. Its oxide wis first isolatit frae rare yird ores in 1878 an the element wis named efter the ceety o Stockholm. 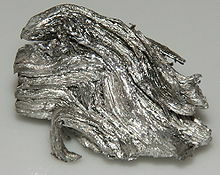 Elemental holmium is a relatively saft an malleable sillery-white metal. It is too reactive tae be foond uncombined in naitur, but when isolatit, is relatively stable in dry air at ruim temperatur. Houiver, it reacts wi watter an rusts readily, an will an aa burn in air when heatit. Holmium is foond in the minerals monazite an gadolinite, an is uisually commercially extractit frae monazite uisin ion exchynge techniques. Its compoonds in naiture, an in nearly aw o its laboratory chemistry, are trivalently oxidized, containin Ho(III) ions. Trivalent holmium ions hae fluorescent properties seemilar tae mony ither rare yird ions (while yieldin thair awn set o unique emission licht lines), an holmium ions are sicweys uised in the same wey as some ither rare yirds in certaint laser an gless colorant applications. Holmium haes the heichest magnetic strength o ony element an tharefore is uised for the polepieces o the strangest static magnets. Acause holmium strangly absorbs neutrons, it is an aa uised in nuclear control rods.